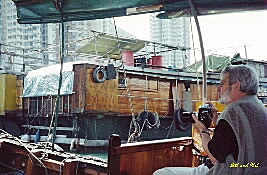 Even though we'd visited Hong Kong twice before we discovered several new and interesting things about the city. 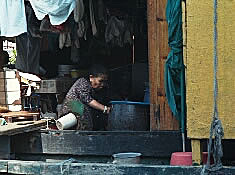 It is rapidly changing since it returned to Mainland China's control in 1997. 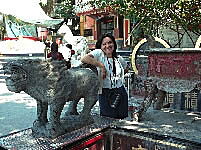 However, those changes didn't change the feel and flavor of this beautiful city, one of Anne's and my favorite cities. 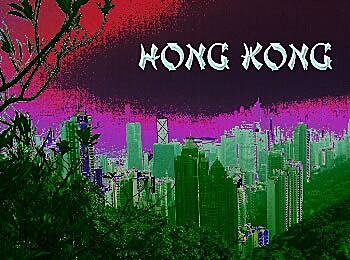 On this and the following Hong Kong pages I'll concentrate on just the new discoveries we made. Arriving late in the evening the first thing we noticed was its brand new, large and modern airport. The airport was under construction during our last visit so this was our first experience with the new airport. As with anything there is always the good and the bad. The good was that it was a beautiful airport, modern, and quite easy to maneuver around. 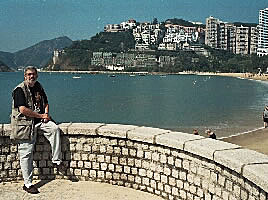 The bad was that it was quite a distance from downtown Kowloon and Hong Kong. 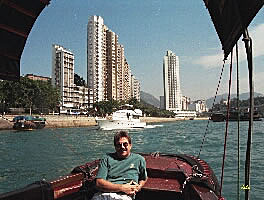 On previous trips the ride from the airport to hotels in either Hong Kong or Kowloon was only a matter of minutes, now the ride is 45 minutes to an hour. I guess it's the price you pay for modernization. Another thing I missed because of the new airport was the landing approach. I'm sure many won't agree with me because there was an element of danger involved in it, but the approach to the old airport was much more exciting and beautiful. During the last few seconds of landing you were actually flying between high-rise buildings that were very close on both sides and higher than the airplane. I found the old airport to offer beautiful views of the city when landing and taking off while the new airport only offers boring views. What trip to Hong Kong would be complete without a visit to the top of Victoria Peak with its splendid views of Hong Kong and Kowloon across the bay? Even though we'd been numerous times before we had to do it again. Only this time I was a bit disappointed for several reasons. First, we had very little time to really enjoy our visit. 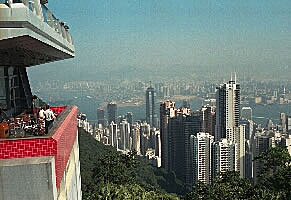 On our previous trips we'd always walked around the top of Victoria Peak and I hoped we'd have the time to do so again, but we didn't. Second, and more important, there seems to be a building boom on top of the peak and, for the part we did visit, it's changing the whole appearance and ambiance of the site. They really need to put a moratorium on any new buildings as it does nothing but distract from this beautiful and peaceful retreat from the city below. There is now a massive tourist building with shops, restaurants and parking that was not there previously. They did, however, build a nice overlook (picture left). Leaving Xi'an we left behind the ever present cloudiness and cold of China, but in Guilin, while there was sunshine and relative warmth, there was an ever present haze. I'd hoped that flying into Hong Kong we'd find sunny and clear skies, but that wasn't to be. 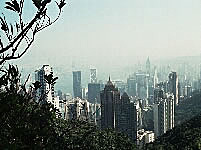 Hong Kong was covered by a heavy haze that made distant viewing from the top of Victoria Peak very poor. But it was still nice to be in the warm, correction, make that hot, temperatures again. Our included city tour started with the tram ride to the top of Victoria Peak and then proceeded to Repulse Bay on the other side of Hong Kong Island. 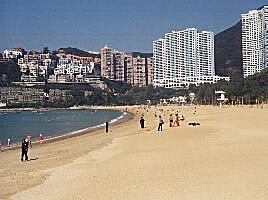 We'd never been to Repulse Bay and found it a beautiful spot for the locals to enjoy. 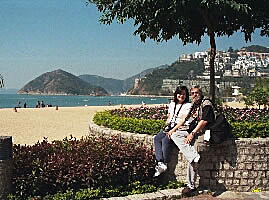 Leaving Repulse Bay we headed over to Aberdeen, home of Hong Kong's famous floating restaurants and the floating fishing village. There we would all pile into small motorized junks for a quick ride through the fishing boats anchored not far away. 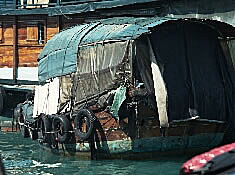 This area is known for these fishing vessels that serve as boat workplace and home to many Chinese. 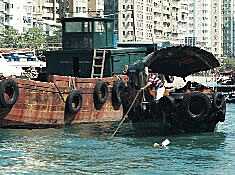 The ships would leave port for weeks at a time fishing the South China Sea and return here for safe harbor. Riding amongst the boats you get a chance to see what life is like for the Chinese fisherman today. 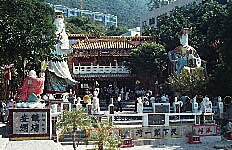 Hong Kong is changing rapidly and this is one of the changes. 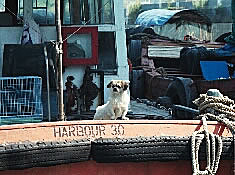 We were told that the Aberdeen fishing community was the last place of its kind in Hong Kong. All of the others have been eliminated. What a shame as it changes the character of this wonderful city. 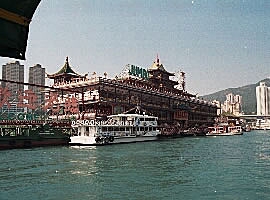 Leaving the junk dock the first thing we saw was the Jumbo floating restaurant. This restaurant is huge and beautiful at night when it's all lit up. Anne and I have eaten there twice before. The food isn't spectacular, but the ambiance is not to be missed. Unfortunately I'd hoped to take Carol, John and Alicia there, but there wasn't any time. After our short ride through the fishing vessels we boarded the bus and headed for our next stop ... the dreaded stop. Remember my telling you that GCT had a planned visit in each city to a shop in the area that was suppose to offer the best merchandise of its type throughout China. 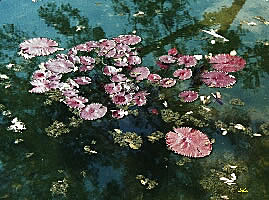 In Beijing it was cloisonné, Shanghai it was silk rugs, Suzhou it was silk bedding and garments, Xi'an it was lacquerware and Guilin it was Chinese art and scroll paintings. Unfortunately in Hong Kong it was jade jewelry. Before we even arrived I knew this was going to hurt. I'd been lucky in most of the other places, but I expected my luck would change here. It did. Anne bought some nice jade jewelry for herself, her sister, Irene, our daughter, Jeannette, and our granddaughter, Alyssa. It was expensive, but what the heck. You only travel this road once and you may as well enjoy it. Unfortunately for me, Anne would like her road paved with diamonds, sapphires, rubies any other precious stone you can think of. I don't blame her. She looks good in it and she works hard enough to enjoy the splurging every once in awhile.